First Line: The tips of the tall turquoise and green hats bobbed in the lightly falling snow as the elves weaved through crowds of painted dolls, toy soldiers, shepherds with their sheep, reindeer, poultry, clowns, sugarplums, gingerbread people, and candy canes. When Merry Wilkinson, owner of Mrs. Claus's Treasures in Rudolph, New York, learns that her parade float was sabotaged, she begins to think there's a Grinch in town. When the sabotage morphs into poisoned cookies that kill a visiting journalist, Merry is stunned. But she's going to have to get herself together quickly. Her best friend is the prime suspect in the journalist's death and needs every bit of help that Merry can give her. 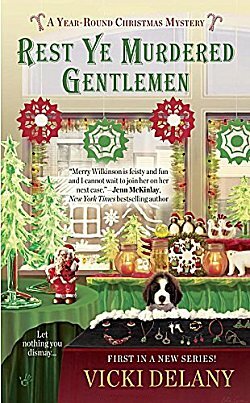 Vicki Delany has written a series that should please all Christmas-loving cozy mystery readers. Rudolph in upstate New York is the town that celebrates Christmas all year round, and Merry Wilkinson is the owner of Mrs. Claus's Treasures-- a shop that I would love to find myself in. (I think I'd have to bring along help to take all my purchases out to my car.) One of the things that Delany makes clear in this book is the fact that it's a cutthroat world for little towns in scenic areas; they are forced to fight for every available tourist dollar in order to survive. I also appreciated seeing that Merry often had a difficult time solving the crime because she didn't always have someone to man the cash register at her shop... the real world creeping in, don't you know. There's a strong cast assembled for Rest Ye Murdered Gentlemen. Besides Merry, there's her opera diva of a mother, and her father is the former mayor and local Santa. When Merry's not stocking shelves, ringing sales, or solving the crime, she's got a St. Bernard puppy named Matterhorn that needs her attention. Any eligible men in Rudolph? Funny you should ask. There happen to be two-- Russ and Alan-- who are slavering after Merry, lucky woman. How do I feel about this first Year-Round Christmas mystery? I have mixed emotions about it. This is a solid mystery-- good plot, good setting, and an interesting cast of characters-- but it just didn't grab me. It may very well be the perfect read-- and the perfect series-- for you (and I hope it is), but when it comes to Vicki Delany's writing, I much prefer her Constable Molly Smith mysteries; they are wonderful. Sometimes books just don't kindle that spark in me, and I hate it when that happens to a well-written book.